THE contrast is so New York: on one block on a recent sunny Saturday, restrained crowds of grown-ups in dark glasses waited for outdoor tables at Pastis, a hot see-and-be-seen restaurant in the ultra-hip Gansevoort Market meatpacking district. On another, at the Bleecker Playground, howling children in colorful clothing cavorted excitedly under a shimmering canopy of bright yellow ginkgo and maple leaves. The two scenes are vastly different slices of the pie known as the Far West Village, where stylish hipster types in the neighborhood's only remaining warehouse district share turf with more and more young families and energetic preservationists. Bordered by West 14th Street to the north, West Houston Street to the south, Hudson Street to the east and the Hudson River to the west, the area is among Manhattan's most architecturally diverse as well as one of its quietest and most villagelike. Housing ranges from lofts to luxurious town houses, on tree-lined streets sprinkled with one-of-a-kind boutiques, restaurants and strong public and private schools. Kathy Reber and her husband, Chris, who are both involved in the theater, will move this month into a loft on the fringes of the Gansevoort Market for which they paid in the high $3 million range. Temporarily subletting in Chelsea after a move from San Diego, Ms. Reber was pleasantly surprised by how child-friendly the neighborhood is. "The Bleecker Playground is loaded with kids and Hudson River Park is just beautiful," said the mother of two boys, Nicholas, 5, and Jacob, 3. "There are a lot of families here." The West Village stretch of the planned five-mile-long, $400 million Hudson River Park is a highly visible symbol of kaleidoscopic changes in the last 20 to 30 years. Since 1969, the designation of the Greenwich Village Historic District has helped to protect the blocks of charming 19th-century town houses, tenements and shop fronts while guiding the conversion of warehouses, former factories, stables and parking garages into residential housing. Some building names tell the tale of former lives, like Le Gendarme and the former Ninth Precinct police station on Charles Street and the Archive on Greenwich Street, which was once the Federal Archives. Luxurious new condominiums along West Street, outside the historic district, are thorns in the sides of many preservationists but are further proof of the area's striking metamorphosis from seedy to increasingly posh. "This was frontier country, the far west, when we moved here 30 years ago," recalled Will Gamble, a photographer of jazz musicians who was among the first residents of Westbeth, the 383-unit rent-regulated former Bell Labs research center converted for artists' use by a Pritzker-Prize winning architect, Richard Meier. "Our neighbors were wharf rats and federal prisoners." No one has done a rat count lately, but the federal prisoners have decamped, and increases in housing prices have forced the departure of many artists, transvestite hookers and much of the gay and lesbian population that gave the area its character. Alex Nicholas, a vice president at the Corcoran Group, says a 1,200-square-foot two-bedroom, two-bath co-op costs $800,000 to $1.5 million for something new or extremely charming. "The area is red hot and has been for as long as I can remember," he said. New condos are roughly 25 to 30 percent more costly than co-ops. Steve Kliegerman, executive director of sales for Halstead Properties, said the average price per square foot of condo space was $700 to $900 — well below the going rate at two glossy 15-story riverfront buildings designed by Mr. Meier at 173 and 176 Perry Street, where buyers purchase raw space. "The units have to be finished but are going for $1,300 per square foot," Mr. Kliegerman said. Units in a third Meier building, on West Street, for which he will also design the apartments, will go on the market next spring. On the site of the former Pathfinder Press, the building will include amenities like a swimming pool, private wine cellars for each apartment and a screening room. One Morton Square, with town houses, lofts, rental apartments and 147 condominium units, is due for occupancy next spring. Two-bedroom, 2.5-bath condo units, some with river views, are priced at $1.3 million. That project's unusual three-bedroom, four-and-a-half-bath town houses with home offices, private elevators and back gardens start at $3.75 million and are among the few available town houses in the area. Sara Gelbard, senior vice president of the Corcoran Group, recently sold a small two-bedroom house in a yard accessible by a horse walk for $2.225 million. Another house nearby is on the market at $2.15 million, she said. "There is not one single house in the West Village now that is under $2 million and anything between $2 and $4 million is really scarce," she noted. THE good news is that rentals are getting cheaper, according to an independent broker, Debra Kameros. She recently rented a one-bedroom floor-through in a brownstone for $2,300, down from $2,800 before Sept. 11. "Things are definitely coming down," said Ms. Kameros, a Village broker for 15 years. "Low interest rates mean that a lot more people can afford to buy." An 800-square-foot, two-bedroom, two-bath apartment at 100 Jane Street rents for $3,600 per month, as does a one-bedroom plus sleeping loft with two baths at the Archive. Both are owned by the Rockrose Development Corporation. Much-in-demand rent-regulated units at the 420-apartment West Village Houses rent from $745 for a studio to $1,460 for a four-bedroom, but the apartment buildings, opened in 1974, will soon begin to evolve out of the Mitchell-Lama subsidy program. Units at Westbeth, officially designated a Naturally Occurring Retirement Community because of the number of residents who are 65 or older, range from $540 for a studio to $922 for three bedrooms. Applicants must meet strict guidelines to qualify; the waiting list is about 12 years long. 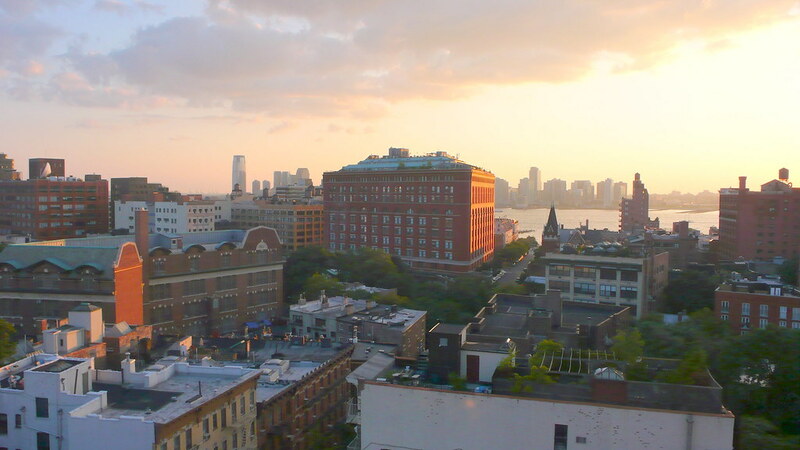 Artists and writers like those at Westbeth have long been part of the scene in the Far West Village, which was settled in the 1700's by Dutch farmers. Residents moving there to flee cholera and yellow fever epidemics downtown in the 19th century swelled the population, but port activity along the Hudson gave the area the rough-and-tumble grit that so appealed to the literati and social marginals it was synonymous with for most of the 20th century. Generations of writers gathered at the White Horse Tavern, founded in 1880 at Hudson and West 11th Streets, including Dylan Thomas, Norman Mailer, Michael Harrington, William Styron, Vance Bourjaily, Pete Hamill and Frank McCourt. Gays and lesbians remain very much a part of the neighborhood, where Congregation Beth Simchat Torah, based in Westbeth, has 800 dues-paying members. On Christopher Street, Bailey-Holt House was the first permanent residence for formerly homeless people with AIDS. It now has 44 residents and is completing a $1.5 million renovation. The rectory of St. Veronica's Roman Catholic Church on Washington Street is home to the House of Love, a 17-resident hospice for men with AIDS. It is staffed by the Missionaries of Charity, founded by Mother Teresa. Parents rave about programs at area schools. Public School 3 on Hudson Street houses 535 students in prekindergarten through the fifth grade in a building that dates to 1905. Fourth-grade students there have some of the highest test scores in the city: 74 percent of students read at or above grade level, while 82.4 percent perform at or above grade level in math. The school puts special emphasis on the arts. Students at P.S. 41 on West 11th Street, which also has prekindergarten through the fifth grade, have even higher test scores. Some 79.8 percent of fourth-grade students read at or above grade level, while 90 percent perform at such levels in math. Many students from these schools go on to the Greenwich Village Middle School, in the P.S. 3 building on Hudson Street. There are 180 students, in sixth through eighth grades, who can take yoga and play in a jazz band in addition to studying academic subjects. Of eighth graders there, 65.1 percent scored at or above grade level in reading, while 64.2 percent performed at or above grade level in math. Private school choices include St. Luke's School, established in 1945 on Hudson Street on the grounds of the Episcopal Church of St. Luke in the Fields, one of the city's oldest churches, founded in 1822. Tuition at the school is $20,000 per student. About 20 percent of the 193 children, in prekindergarten through eighth grade, get scholarships. For children ages 2, 3 and 4, the 41-year-old West Village Nursery school on Horatio Street, a parent co-op, charges $2,330 to $7,550 per child. There are 48 students, who look forward to tapping the backyard maple tree for syrup in March and making jelly from home-grown grapes in the fall. The West Village Community School, on West 10th Street, was started in 1973 and has 313 students in kindergarten through the eighth grade. Tuition is in the $20,000 range. Christopher Street has long had a hopping bar scene, and Hudson Street, the main commercial drag, is rich in shops and restaurants like Sazerac House, popular for brunch, or the Cowgirl, famous for fried Texas fare. But it is the Gansevoort Market, also known as the meatpacking district, that the chattering classes have designated the borough's most chic entertainment district. Meat market blood still tints the cobblestones in the wee hours, but the 24-hour-a-day scene now includes a roster of hip restaurant and bars like Florent, which opened in the mid-80's; Le Zoo, which serves French fare; Pastis, a French brasserie; and others like Meet, Rhône and Macelleria, all on Gansevoort Street. Despite expected landmark status for the meatpacking district, the arrival of the Hotel Gansevoort and high-end retailers like Diane Von Furstenburg, Stella McCartney and Jeffrey, and the influx of buyers of Perry Street condos like Martha Stewart, Nicole Kidman and Calvin Klein have some longtime residents muttering, "There goes the neighborhood!" One Westbeth resident, Mae Gamble, worries about inevitable increases in the price of services as the area goes increasingly upscale, but she has seen plenty of change in 30 years and shrugs it off. "We still have diversity," she said, "it is still charming, we still get a lot of light and my husband still does all his errands on a bicycle." Jeffery Corrick, artistic director of the Wings Theater in the Federal Archive Building, said his new annual rent would be $90,000 and his budget is $100,000. The Federal Archive Building, a sprawling Romanesque Revival structure near the waterfront in the West Village, has played many roles since it was built in 1899. For decades it was a fortress where government documents gathered dust, before becoming a post office and then falling vacant. 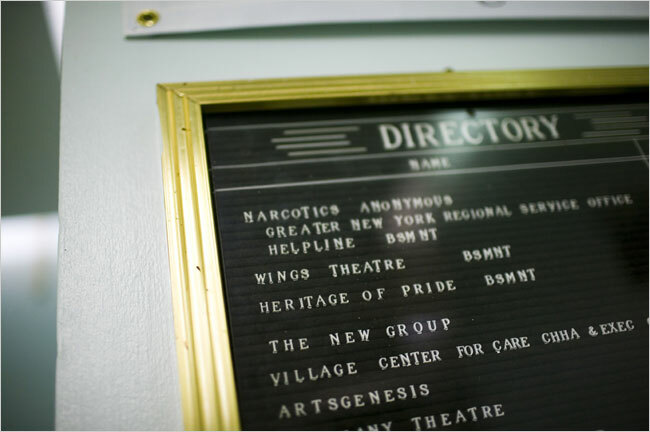 A directory of tenants lists several nonprofit organizations. In the early 1980s, when the western edge of the Village was rather forlorn, the hulking building was reincarnated as a habitat for the wealthy and a haven for nonprofit cultural groups and social service providers. Most of the 10-story building, which was transferred to state ownership from the federal government in the 1970s, was converted into 479 luxury apartments, as well as commercial space. Part of three floors and the basement were leased at below-market rents to four small theater groups and to four organizations helping drug addicts, the elderly, small literary publishers and advocating for gay rights. But now, some of those organizations, which helped revitalize the neighborhood, are facing huge rent increases that could force them not only from the building but from the neighborhood. The neighborhood is much nicer than when the nonprofit tenants moved into the raw spaces in the archive building, on Christopher Street between Greenwich and Washington Streets. Gleaming high-rise buildings line the once-decayed waterfront, and gentrification has long since pushed out many of the neighborhood’s artists, musicians and playwrights. Celebrities walk tiny pedigreed dogs past the D’Agostino supermarket in the building’s southern end, while office workers head to yoga classes at the Crunch gym in the building’s northern end. In the early 1980s, state officials gave the Rockrose Development Corporation permission to convert the vacant red-brick building into luxury apartments, but with a condition: The company would have to set aside 54,000 square feet for local nonprofit groups whose rent would be 80 percent of the market rate . The lease that those tenants signed with Rockrose was for 25 years, and it expires at the end of this month. During the summer, Rockrose informed the nonprofit tenants that their annual rents would increase by as much as 500 percent, according to a statement by the developer at a recent meeting of the local community board’s zoning and housing committee. The announcement sent many of the tenants into a panic. 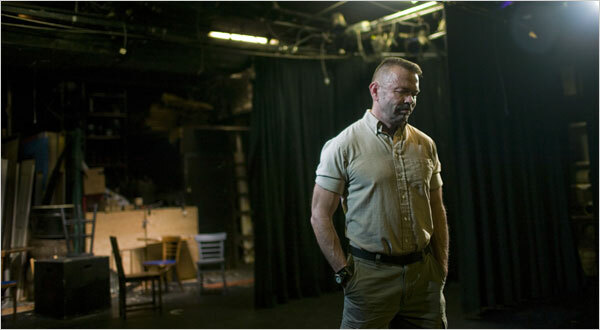 “We and Rockrose live in different universes,” said Jeffery Corrick, the artistic director of Wings Theater, which has produced new plays on its small basement stage for 18 years. Mr. Corrick said Rockrose told his organization that its monthly rent would increase to $7,500 from $1,500. That translates to an annual rent of $90,000, while the group’s annual budget is $100,000. “What’s reasonable to them would, in effect, drive us out of business,” Mr. Corrick said. Patricia Dunphy, a vice president of Rockrose, said the nonprofit organizations knew an increase was coming because they were warned that their rents would be raised once the leases expired. “This was not a big surprise,” she said. Local elected officials have become involved in the dispute, hoping to find a way to allow the nonprofits to keep their spaces. The community board is pressuring the Empire State Development Corporation, which owns the property, to work out a compromise. “These not-for-profits perform a lot of important services, and now they’re being priced out of the neighborhood they helped found,” said Brad Hoylman, the chairman of Community Board 2, which covers the area. The development corporation and the City Council speaker, Christine C. Quinn, have said they are meeting with both sides to find a solution. But it is unclear how much state officials can do, because Rockrose signed a 99-year lease with the state on the building in 1982, making the company the effective landlord. Some of the nonprofit organizations, including Heritage of Pride, a gay advocacy group, and the Village Center for Care, a health services agency that receives government financing, said they had reached a verbal understanding with Rockrose on an increase they could afford. Built near the waterfront as a warehouse for the U.S. Customs Service, this 10-story building was the largest structure to date in Greenwich Village. It is a typical Romanesque Revival building featuring round Roman arches, wide piers, and massive brick walls that are as thick as three feet at the base. Above, the masonry facade is broken by regularly spaced square and arched windows and a heavy cornice with arched corbel tables. Soon after its completion, the building was taken over by the U.S. Federal Archives. Since each floor contained over one acre of square footage, it was highly suitable as storage space for the agency's archival materials. Renovated in 1988, the building was converted into 479 rental apartments offering views over the Hudson waterfront and the West Village. An interior atrium was carved into the center of the building and retail spaces were integrated into the base. Some of the income generated from the building is used for historic preservation activities under the jurisdiction of the New York Landmarks Conservancy. Last edited by brianac; October 14th, 2008 at 03:04 PM. 25 years wasn't enough time to search for a new space? Nobody bothered to read their lease? The Archives building . . .
. . .since renters are always calling me about it, let me warn interested parties that the building is "small dogs only," with a weight limit of 30 pounds. On first glance, all of the five-story townhouses lining West 11th Street between Fifth and Sixth avenues blend together, lending the block the same charming and unaffordable air of any other in Greenwich Village. The sharp, three-story bay windows at No. 18 quickly pierce the illusion, jutting four feet past the facades of the neighboring buildings. A Paddington bear doll in an orange cloak and black witch’s hat stands next to a ceramic jack o’ lantern in the first-floor window. The starkly modern building begs to be recognized, for its incongruity and its history. On March 6, 1970, five members of the radical Weather Underground accidentally detonated dynamite at a makeshift bomb factory in the basement of 18 West 11th Street. The bombs were, according to rumors, destined for a military compound in New Jersey and for Butler Library at Columbia University. While the incident may still reverberate for those who experienced it, otherwise today it seems to have faded into the neighborhood’s distant collective memory—despite the media scrutiny over Barack Obama’s tenuous connection to Weatherman co-founder Bill Ayers. Coincidentally, one of the few passersby who immediately recognized the building was another famous local, actor Andrew McCarthy. But most of the 20-odd people I spoke to over the course of two days were only vaguely aware that something had happened at 18 West 11th nearly four decades ago, if at all. “Wasn’t there an explosion there or something in the 1960s?” asked Prudential Douglas Elliman broker Leonard Steinberg over the phone Saturday. The doorman at 40 Fifth Avenue; the bellman at the Larchmont hotel across the street; a construction worker from a nearby townhouse; and a pair of middle-aged, female joggers all had similar reactions. The four Danish tourists passing by Friday evening were much better informed. They had come to West 11th Street specifically to see the “Weatherman House,” because it is the 10th stop on Lonely Planet’s “Village Radicals” tour. 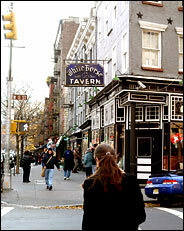 Other destinations include the Oscar Wilde Bookshop, Bob Dylan’s former haunt Fat Black Pussycat, and Washington Square Park. Jesper Selch said the best part of the tour so far had been a decidedly anti-radical urban phenomenon. “I guess it’s another way to socialize,” his wife offered. Before the group moved on to dinner in the West Village, to be followed by the Empire State Building “to see the lights,” Mr. Selch doubled-back. “You don’t work for Fox News, right?” he asked worriedly. Some people seemed more offended by the motives of No. 18’s architect than by those that motivated the Weathermen to concoct bombs in a basement of an upscale Manhattan neighborhood. Broadway lyricist and film executive Howard Dietz bought 18 West 11th Street in 1930, according to The Times, followed by radio executive James P. Wilkerson in 1963. In August 1970, Mr. Wilkerson sold the property, just four months after his daughter Cathy reportedly emerged naked from the wreckage and went into hiding. No. 18 remained vacant for the next eight years while architect Hugh Hardy, a partner at Hardy, Holzman, and Pfeiffer, battled with Community Board 2 and the Landmarks Preservation Commission over an exterior design plan that opponents said was too radical for the traditional block. Enter David and Norma Langworthy, who quit Greenwich Village and the theater life for Philadelphia shortly after their 1943 marriage. The former set designer and his Broadway bride settled into their new roles as business executive and mother, but they vowed to return to New York. Nearly four decades and as many children later, the couple made good on their promise. In June 1977, they bought the vacant land at 18 West 11th Street, city records show, just a few doors away from the rented, basement apartment where Mr. Langworthy proposed. Ms. Langworthy told The Times in 1981 that her tears at a 1978 Landmarks hearing ultimately swayed community opponents. The Langworthys moved into their new home—a slightly-modified version of Mr. Hardy’s original vision, to preserve the scale and character of the block—in 1978. The bear has reportedly remained in the window ever since, but his ensemble changes according to the season. Few remnants of West 11th Street’s more radical past remain, save for a pink peace sign spray-painted onto the trash container in front of No. 26, to the left of No. 18. © 2008 Observer Media Group, All Rights Reserved Worldwide. And no mention that Mr. Ayers was ever in that building -- if not then the hook upon which the story is premised is non-existent. SCAFFOLDING is finally being stripped, as part of the metamorphosis of a slice of tree-lined West 12th Street near the Hudson River, where the recession has failed to halt construction of three high-design apartment buildings. NEIGHBORS 385 West 12th Street, a copper-paneled tower designed and built by FLAnk. 397 West 12th Street, by the architect developer Cary Tamarkin. 400 West 12th Street, a k a Superior Ink, by Robert A. M. Stern. The West Village block, between the river and Washington Street, was still dominated by former factories earlier this decade, but it has become solidly residential. Now, despite the severe real estate market downturn, property developers have forged ahead with construction of the three buildings, all meant to be architectural standouts. The Related Companies, a national real estate development firm, is building a tower with 68 condominium apartments and seven town houses, designed by Robert A. M. Stern, at 400 West 12th Street. The complex is named Superior Ink, after the 1919 building it replaces. 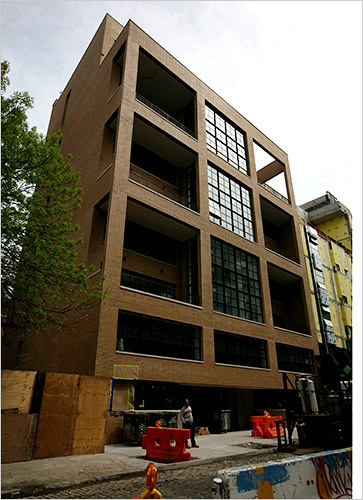 Across the cobblestone street, the architect-developer Cary Tamarkin of the Tamarkin Company has almost completed a building with five apartments, the smallest at 3,000 square feet, at 397 West 12th Street. And next to that, at No. 385, is a copper-paneled tower of six flats, four town homes and two penthouses by the architecture-and-development firm FLAnk. In a city punctuated by motionless cranes, Mr. Tamarkin says he considers it an achievement just to have completed his 10-story building, which has a facade of Roman brick and multipaned industrial steel windows meant to call to mind a maritime warehouse. “You’re lucky if your project is not at a complete standstill; if you have a bank that’s still funding; and if you have equity partners that are still putting money into projects,” he said. While designers may be impressed, it remains to be seen how well the new apartments will sell. Though the West Village is one of the most established and pricey neighborhoods in Manhattan, sales have been sluggish since the recession began. 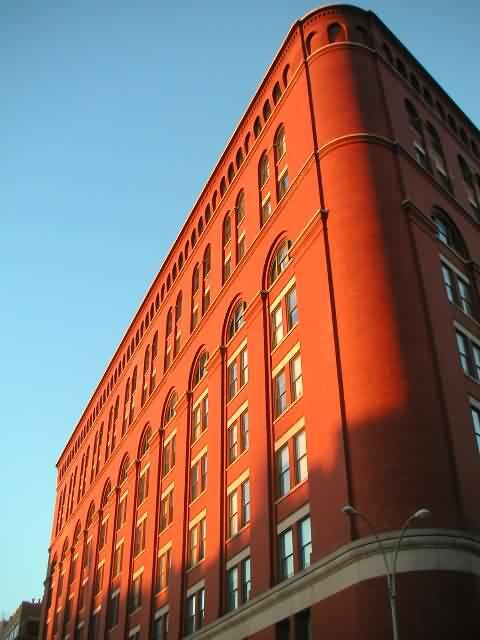 At that time, Superior Ink — a 17-story brick-and-stone ziggurat with expansive arched windows, slightly evocative of a factory, sitting alongside seven traditional-looking town houses with bay windows — was 95 percent sold at an average of more than $3,000 a square foot, according to published reports. But two months ago, the company reported that only 80 percent of the units were in contract. The tabloids reported in March that the designer Marc Jacobs had bought a town house at Superior Ink for about $2,888 a square foot. 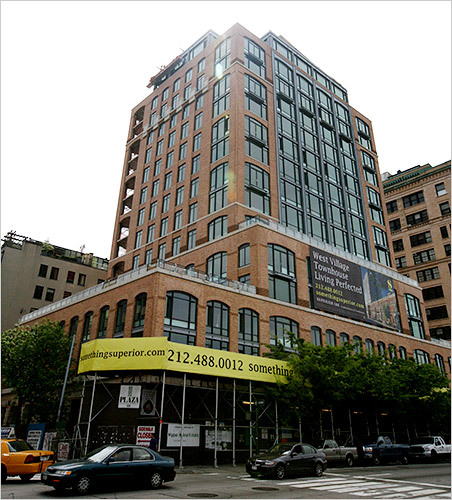 Tim Crowley, the managing director for development at FLAnk, said his company had sold 7 of the 12 apartments at 385 West 12th Street, but all the sales took place last summer. Apartments in the contemporary seven-story tower — which in renderings appears to be a jumble of windows on various planes, vertical ribbons of translucent curtain wall and copper panels that will eventually turn bluish-green — are going for an average price of about $2,000 a square foot, he said. Mr. Tamarkin, who began sales last summer, has sold only one of the five apartments, the four-story penthouse, to a partner. In April, he cut his prices by 15 percent. “Related did fantastic with their building prior to the recession — they achieved record-setting prices, so hats off,” Mr. Tamarkin said. But he cautioned that the development company still has to close on the apartments. “You have to see if people stick to their contract prices,” he said. Mr. Wine said that Related expected closings to take place this summer. Mr. Tamarkin said he had faith in the neighborhood over the long haul, especially with a lack of future development opportunities. A little bit of London in New York City has become even more enticing now that two new townhouses, which can be converted into one monster home, are hitting the market today for a combined $33 million. The townhouses are currently under construction at 22-24 Downing St. in the West Village, steps from Winston Churchill Square. A buyer would be able to customize and transform the two townhouses into one 12,127-square-foot, 50-foot-wide, six-story home. The six-bedroom, five-bathroom stunner would include its own garage, a 22-foot-high living room and a garden. A third townhouse will be built at 26 Downing St. and is on the market for $16.95 million. That townhouse offers five bedrooms, five bathrooms and 6,534 square feet. All these townhouses, which are slated for completion next March, will include elevators, rooftop terraces and at least one fireplace. Major landscaping will include adding large trees and plants to the block. Prudential Douglas Elliman broker Leonard Steinberg has the exclusive listings and notes that it is unusual for anyone to be able to create a modern home from scratch in the middle of such a heavily landmarked district. The developer is Urban Muse, also responsible for 200 11th Ave. The architects are David Piscuskas and Juergen Riehm, of 1100 Architect, which has done work for Harrison Ford and Diane Sawyer. This one at 385 W 12th seems stalled. No more copper cladding has been put up in the last 3 months (although more glass has gone up). 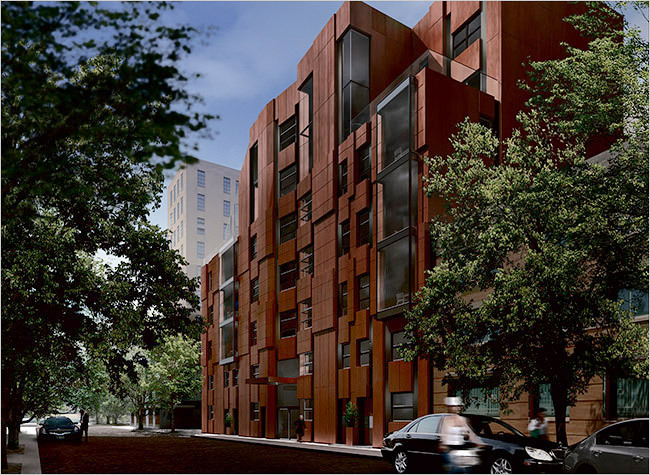 385 West 12th Street, a copper-paneled tower designed and built by FLAnk. The city is moving to rezone a six-block area in the far West Village, a victory for local preservation groups and a potential obstacle for developers in the area. The rezoning would affect buildings between Washington and Greenwich streets, from 10th to 12th streets. The effort is expected to take six months to a year to complete. The area currently has no height limits and allows bonuses, or greater sizes, for "commercial developments," such as hotels, and "community facilities," such as dorms. The new zoning would impose height limits on new development, limiting it to 40 to 65 feet at street wall, and a total height limit of 80 feet. Bonuses for commercial and community developments would be eliminated and all designs for new development would be subject to public hearings and approval by the city's Landmarks Preservation Commission. Andrew Berman, executive director of the Greenwich Village Society for Historic Preservation, called the current zoning "outdated" and "anomalous." A proposed hotel at 145 Perry Street was approved last year by the LPC, which reduced the height from 90 feet to 78 feet, after opposition from preservationists. In September, two townhouses adjacent to 145 Perry were listed at a combined $44 million for 14,000 square feet. Developer Robert Gladstone of Madison Equities is developing the two townhouses in conjunction with the hotel which he called in a Times story "the love of my life — I’ve wanted to do that for a very long time." But Mr. Gladstone may have to wait longer: Unless he builds the hotel's foundations or can show "substantial expenditures" before the new zoning takes effect, 145 Perry Street would have to conform to the new regulations. The GVSHP site notes that, following the LPC's height revisions, the hotel's current design will "roughly conform to the height limits of the new zoning," but may still require reductions. Mr. Berman said that construction had not begun on the hotel. The GVSHP also identified other areas where current buildings are smaller than zoning currently allows. The group argues that this would open the door for demolition and new development, which it says would compromise the largely residential character of the neighborhood. A COALITION OF preservation groups, including the GVSHP, Greenwich Village Community Task Force and Community Board 2, have been pushing the City Planning Commission for a rezoning of the area for over a year-and-a-half. In a letter to the commission's chair, Amanda Burden, in April 2008, the group urged a change in zoning, citing 145 Perry and another mixed-use building, at 685 Washington Street, as "rather large development proposals" that didn't fit the character of the neighborhood. Six months later, in another letter, the GVSHP again called for rezoning and said it had not received a response from City Planning. In September, a set of local elected officials threw their support behind the movement, reiterating height concerns and pushing for a more restrictive zoning. A letter to Ms. Burden was signed by City Council Speaker Christine Quinn, Manhattan Borough President Scott Stringer, Congressman Jerrold Nadler, State Senator Thomas Duane and Assembly Member Deborah Glick. They stated that they felt in 2005 that the LPC's designation of the area as a historic district would protect it from "non-contextual development," but now had additional concerns. On Nov. 18, the elected officials informed residents that City Planning had decided "rezoning is warranted and that a [contextual] district would be appropriate," giving much credit to Community Board 2, which it called "instrumental." City Planning will begin conducting an environmental assessment, followed by public hearings, although timeline details were still unavailable, according to the letter. A City Planning spokeswoman confirmed that the agency planned to downzone the neighborhood. On google streetview i noticed that there was a building under construction at the intersection of jane and washington streets. Unfortunately i cannot seem to find any information or renderings of the project. Does anyone know what's going on there? That is basically a re-build of a building that used to be on the site, same size & same materials. But instead of a warehouse it will now be a 20,000 sf one family dwelling. The owner bought it for $34M shortly before the market sank. No idea. Here's the permit information.